Themed 4 in 1 Large Combo contains jumping area, basketball hoop, ‘rock wall’ climbing hill, super fast slide angle at an exhilarating angle. Unit is 18'Lx16'W but needs at least 20' all around unit for setup clearance. Don't forgot to LOOK UP, there needs to be at least 18' of overhead clearance, - no wires or branches! ) Features; fire resistant vinyl, finger entrapment proof fire resistant mesh, blower, owners manual, tarp, Price includes; Rental, local delivery, set-up, take down, return to our warehouse and proprietary online safety/supervisor training with certification program. Includes stakes and/or sandbags/water containers for anchoring unit, ground cover and entry/exit mats. Includes 50' lighted electric cord and GFCI cord. THIS UNIT REQUIRES A DEDICATED 20 AMP CIRCUIT, with NOTHING else on it, or the unit will not inflate! 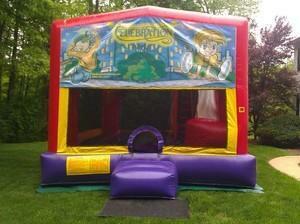 Up to 6 children may use this unit at the same time, with a 500 lb. limit. Of the children a maximum of one child may climb the hill on the slide at a time, and then sit at the top and go down feet first only. Children must move immediately after sliding. No one may slide down the rock wall/climbing hill to the jumping area. Minimum rider height is 40.0". Slide may also be used as a water slide - ask for details!